Old toys & cars & pics & Crystal Palace & some other stuff…. Very foggy autumnal evening. Some bargains available, but not very well attended and some regular sellers still absent. But it makes for a reasonably pleasant way to pass an hour or two. And here we have; a 1950s Hornby-Dublo cast signal box, a 1960s Airfix 2-6-2 tank loco kit, (both OO scale), a modern Matchbox Yesteryears Citroen H-type van (approx 1/43 scale) and a Majorette 1/60 scale Ford Model A van (McVities livery), which appears to be a copy of the 1980s “Matchbox” casting. Total outlay GBP10, not too bad. 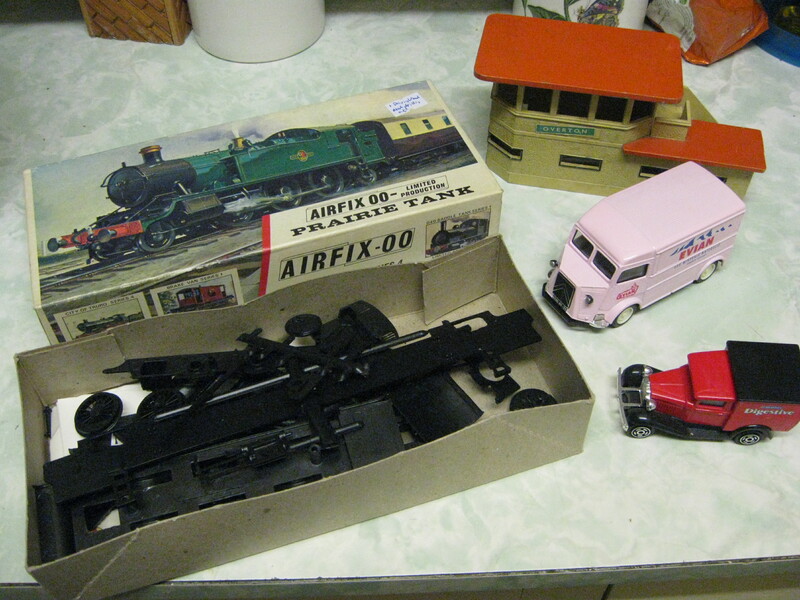 This entry was posted in Cars, Photos, Toys, Trains and tagged 1950s, 1960s, 3 rail, Airfix, Canon A590is, Hornby, Hornby Dublo, Majorette, Matchbox, OO Scale, plastic kit, Toys, Trains.